I strive to empower those around me with the confidence to advance the scientific field, each and everyday. after they make a breakthrough and unravel the problem, I think they feel invincible. 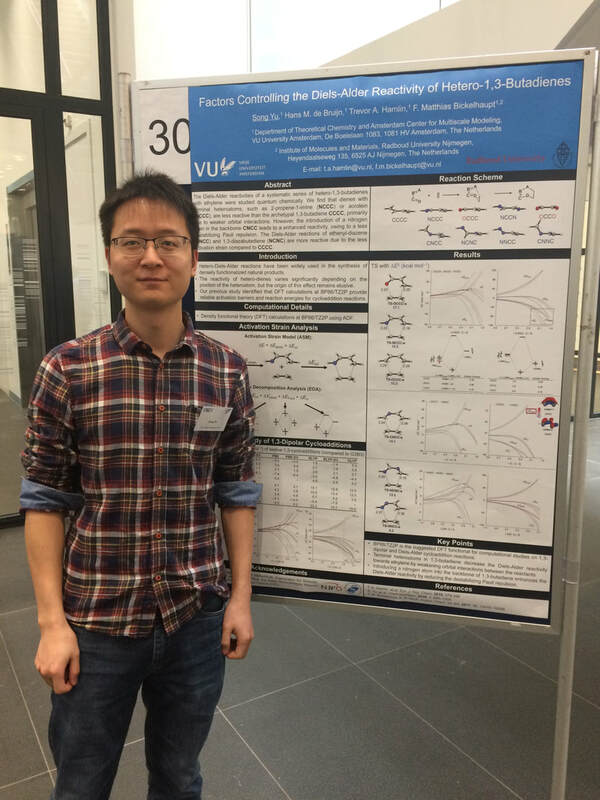 On 26 March 2019, the first annual symposium of the Computational and Theoretical Chemistry (CTC) Division of the Koninklijke Nederlandse Chemische Vereniging took place in the Auditorium of the O|2 Building at Vrije Universiteit Amsterdam. With around 120 participants, top speakers, and 50+ excellent posters, it has been a great day!! I delivered an invited lecture and we had a number of outstanding poster presentations from the group members! Here are some photos of the day. The 23rd International Conference on "Horizons in Hydrogen Bond Research" (HBOND2019) will be held from September 24 till September 27 in Amsterdam, The Netherlands. We have an outstanding program with speakers from all around the world. I hope to see you in Amsterdam! Second European Symposium on Chemical Bonding ​in Oviedo, Spain! Thanks for Célia Fonseca Guerra for the photograph! From the news article: "VU Theoretical chemists Trevor A Hamlin and Matthias Bickelhaupt have revealed how magnesium ions lower the reaction barrier in enzymatic triphosphate hydrolysis (a key step in DNA replication and other reactions that are vital to life), using quantum chemical methods." Read the full article HERE. Full paper in Chemistry – A European Journal! Barrier or no barrier? A full account on the solvent-induced changes to the potential energy surface (PES) of a variety of nucleophilic substitution (SN2) reactions is reported. We provide simple guidelines, based on differential solvation of the electronic structure of a reaction system, to understand when and how minima and maxima appear along the PES. Review Article on SN2 Reactions in ChemPhysChem! The reaction potential energy surface (PES) and, thus, the mechanism of bimolecular nucleophilic substitution (SN2) depend profoundly on the nature of the nucleophile and leaving group, but also on the central, electrophilic atom, its substituents, as well as on the medium in which the reaction takes place. In this review article, we provide an overview of recent studies and demonstrate how changes in any one of the aforementioned factors affect the SN2 mechanism. I could not be more proud of this paper, as it mark my first one as a corresponding author! It is a key work in the study of SN2@P reactions, which are key in DNA replication or transcription concominant with backbone elongation in the newly forming DNA or RNA strand. ​We explore the effects of triphosphate deprotonation and elucidates the physical factors underpinning the enzymatic role of Mg2+ ions on this pivotal SN2@P reaction. ​Paper in JOC in collaboration with the Houk Group at UCLA! The endo and exo stereoselectivities of Diels–Alder reactions of cyclopropenone, iminocyclopropene, and substituted triafulvenes with butadiene were rationalized using density functional theory calculations. We highlight the role of secondary orbital interactions and charge transfer in determining the stereoselectivity of this transformation! ​Paper in JOC with the Rutjes Group at Radboud University! First and foremost, a well deserved shout out to Bas van Beek on his first (of many) paper in my group! I just love collaborating with experimentalists and this paper in JOC was just that. Description without jargon: Collegues from the group of Floris Rutjes at Radboud University and Bayer CropScience have discovered a way to synthesize molecules that have a really cool group on them (-SCF3). These compounds have potential applications as drugs and agrochemicals. ​​​​​​​​​​​My group modeled the reaction on a supercomputer and determined the reason why they obtained only 1 of 4 possible products: steric interactions drive regioselectivity. This is a big step towards a more rational design of novel chemicals in the future! ​Invited Talk at CHAINS 2017! A special thanks to professor Célia Fonseca Guerra for the invitation to give a talk on my recently published work. CHAINS 2017 is the largest chemistry conference in The Netherlands. The conference was held in the small town of Veldhoven, just on the outskirts of Eindhoven. It was an amazing time where great science was disseminated and allowed the group to engage in some quality bonding time. Happy to have had the opportunity to speak and am looking forward to next years edition! 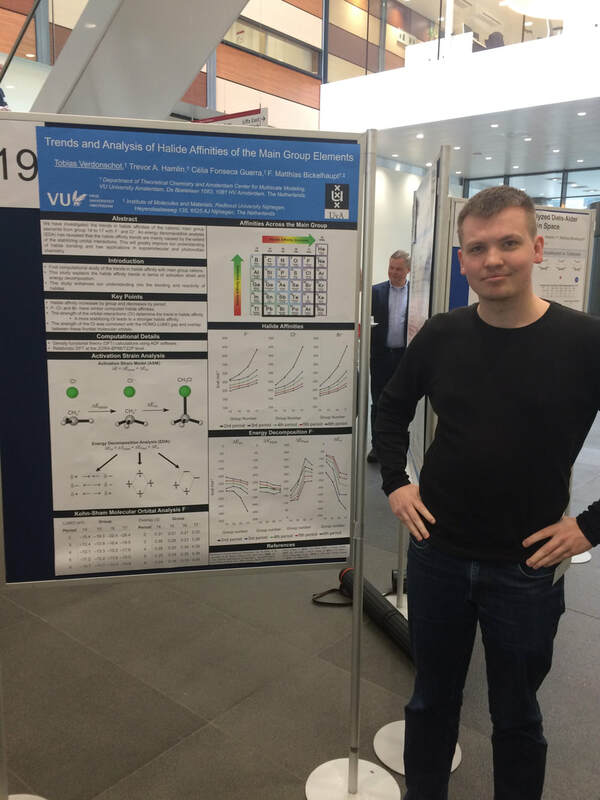 ​Bas van Beek's Poster Presentation at CHAINS 2017​! Congrats to Bas van Beek for successfully presenting his first poster at CHAINS 2017. 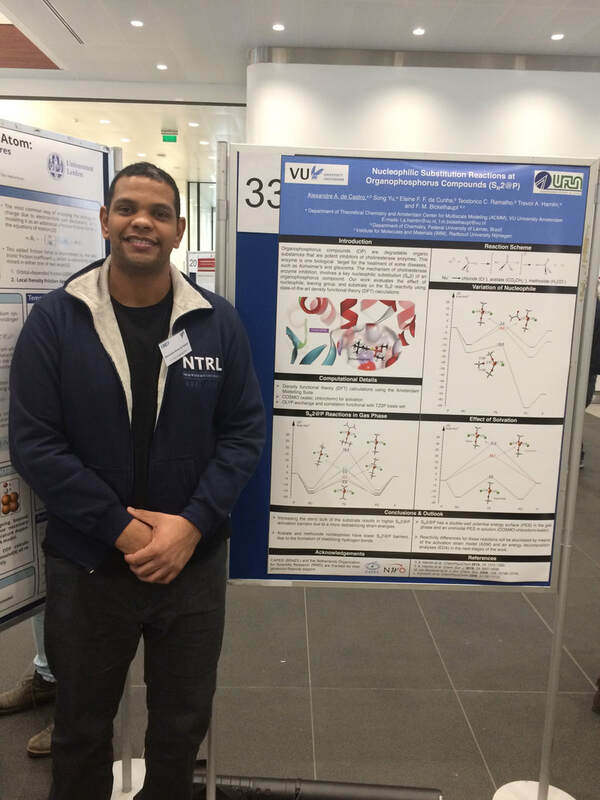 His poster summarized some of the recent work we've carried out in collaboration with our colleagues at Radboud University towards understanding and predicting reactivity of 1,3-dipolar cycloadditions involving –SCF3 alkenes. The paper has been submitted to JOC and will be published later this month. Well done Bas! ​Had a lovely day in Leiden at the Lorentz Center for Day 1 of the DNA Damage and Repair Conference. I gave a short talk, panel discussion, and poster presentation. ​I really enjoy these smaller conferences where you can actually engage in more meaningful discussions about science. It is also great when you can get experimentalist and theoreticians into the same room, bouncing ideas off that wall! ​Paper in JOC with the Houk group at UCLA! The Diels–Alder reactivities of a series of cycloalkenes, from the highly strained cyclopropene to the unstrained cyclohexene, have been studied with density functional theory using the M06-2X functional. Previous studies showed that activation strain computed from the distorted reactants in the transition structures are larger for unstrained than strained cycloalkenes, and that most of the activation energy differences are accounted for by this difference. Our analyses reveal that the strain curves associated with the distortion of the reactants in the Diels–Alder reactions are nearly identical and that the reactivity differences originate from differences in interaction energies from analysis along the reaction coordinate. Analysis of the diene-dienophile interactions reveal that the reactivity trends result from differences in the strength of the primary and secondary orbital interactions. Paper in Chem. Asian J. with the PZ group at UCONN! The shapes adopted by large-ring macrocyclic compounds play a role in their reactivity and their ability to be bound by biomolecules. We investigated the synthesis, conformational analysis, and properties of a specific family of -macrodilactones as models of natural-product macrocycles. Analysis of the compound, in comparison to an α-substituted regioisomer, by using X-ray crystallography, NMR coupling constants, and reaction-product characterization in concert with computational chemistry, revealed that the alkene unit is dynamic. The results underscore the local conformational dynamics observed in some natural-product macrocycles, which could have implications for biomolecule binding. We have computationally analyzed a comprehensive series of Watson–Crick and mismatched B-DNA base pairs, in the gas phase and in several solvents, including toluene, chloroform, ammonia, methanol and water, using dispersion-corrected density functional theory and implicit solvation. Our analyses shed light on how the molecular-recognition machinery behind life’s genetic code depends on the medium, in order to contribute to our understanding of the possibility or impossibility for life to exist on exoplanetary bodies. Calculations show how a common non-terran environment like ammonia, less polar than water, exhibits stronger hydrogen-bonding affinities, although showing reduced selectivities towards the correct incorporation of Watson–Crick base pairs into the backbone. Thus, we prove the viability of DNA replication in a non-terran environment.